Although this wasn't really a Susquehanna Iron Masters event, one of our members did go down to support Randy and his gang, as they put on a great DOG at the Blue Rocks Family Campground in Lenhartsville, PA. Randy broke out his 1870's chuck wagon, and we all had a great time putting on demonstrations and cooking for the campground. There was lots of good food, and great times. We have a few photos too. This was a great place to have our DOG, and we will more than likely have another one here in the future. Everyone had a great time, and we are looking forward to more gatherings in the future, hopefully in some warmer weather. We hope to see everyone at our next event. We hope everyone had a good time and will join us again real soon. The best thing about this DOG, was we decided to share samples with the crowd, and spread the word about how great Dutch oven cooking can be. The response was overwhelming to say the least. It was a very successful day, and good fun was had by all. Thanks to all that came out, and we hope to see everyone at our next event. We all had a great time, and are looking forward to the next gathering. 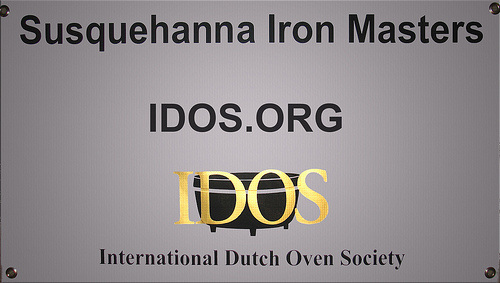 We have received our banner from the International Dutch Oven Society. So there is no denying us now. We are the official Central Pennsylvania chapter of the IDOS. It really got us motivated to get things rolling on our own gatherings.